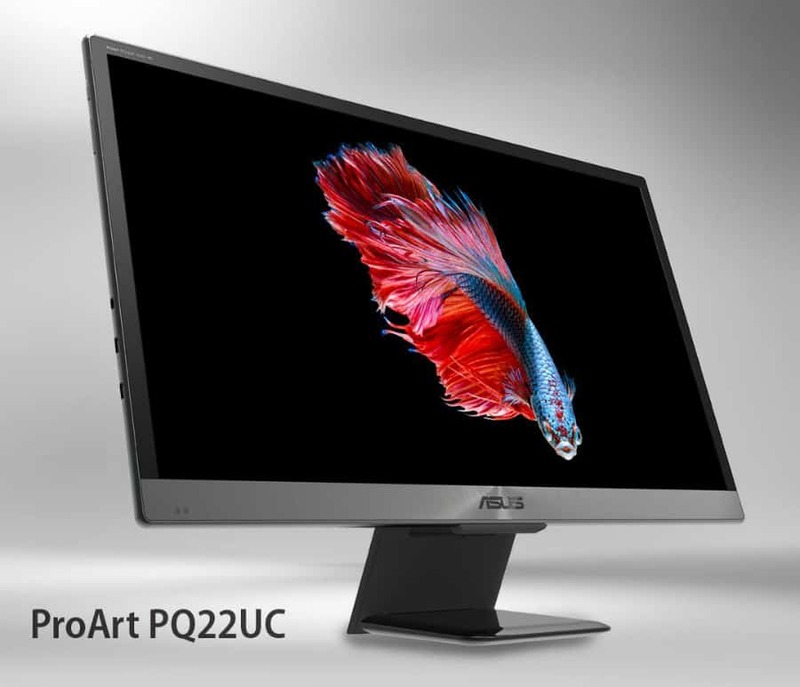 The Asus PQ22UC is a stunning and unique professional monitor with OLED technology that is capable of extensive gamuts and unrivaled crispness. This 22-inch monitor is a great pair for working on a desktop or taking it with you as its design encompasses portability in its functionality. If you are looking for the perfect designer monitor to pack with your MacBook Pro or any USB-C laptop, the Asus PQ22UC could be the best solution. The Asus PQ22UC utilizes the ProArt design treatment which comprises an ultra-thin chassis and premium quality materials with metallic textures. The product isn’t as border-free as we would like since there are thin dual stage bezels on three sides and a thicker bottom strip with a polished metal texture. What we love about the Asus PQ22UC is its emphasis on portability which is immediately apparent from its modest dimensions. The Asus PQ22UC aims to fit into a laptop case or bag for when you need to work on the go. At one angle, anyone could easily mistake this display for a large tablet, which is a role it could fulfill if it had a touchscreen. Also, It’s almost too small to be a dedicated desktop display, but its 22-inch form factor is still a reasonable compromise for both scenarios. Another ingenious feature of the Asus PQ22UC is the included stand which is designed to work both ways. The rather simple device only offers tilt and a mild height adjustment to give the product a bit of flexibility. This mechanism is also completely removable and foldable, making it convenient to slip into one of your laptop case’s pockets. Connectivity on the Asus PQ22UC isn’t as impressive as most would like it to be, although it should be sufficient for the product’s duality. The limited I/O layout only includes a USB-C slot and a Mini HDMI 2.0 port. There are no exact details on how this OLED monitor will draw power, but we suspect it will draw power from your laptop if used on the go. The Asus PQ22UC boasts a 21.6-Inch OLED panel with a 3840 x 2160 resolution, a presumed 60Hz refresh rate, 100000:1 contrast ratio, and an unbeatable 0.1ms response time. The module to be used is a product of JOLED which is a joint manufacturing venture between Panasonic and Sony. While it has been impossible to get a monitor equipped with this tech, JOLED says that the 21.6 panel to be used is already in full-swing production. A UHD resolution squeezed into a 22-inch screen equates to a pixel density of 204PPI which should offer extremely crisp and detailed images. This formulation allows a comprehensive digital workspace to fit into a lightweight mobile package, allowing professionals to work anywhere. The only issue we could see right now is that text could be too small on this display, but high-resolution images will be extra sharp. Another impressive promised capability of the Asus PQ22UC is its imaging qualities which are brought about by the OLED panel. The firm announced that the 10-bit panel with 1.07 billion colors is capable of 99% DCI-P3 which could enable excellent HDR support. There is, however, no word on Adobe RGB, sRGB, or Rec. 2020 compatibility. Asus also did not announce compatibility for HDR specs such as HDR10 or Dolby Vision, but they did say that the Asus PQ22UC’s dynamic range is broad enough to support HDR content. There is also no exact detail on how high the OLED screen’s brightness can go, but it can drop to a .0005 minimum which is beyond impressive. Of course, all of these vibrancy jargons aren’t worth a lot to professionals if the accuracy is not on point. So it’s a good thing that the brand guarantees a DeltaE of less than 2.0 via the Asus ProArt Calibration feature. This aspect of the Asus PQ22UC is also beneficial for mobile usage since it saves color profiles in the device itself, allowing future owners to use several host devices. The Asus PQ22UC is one of the most exciting products to come out of CES 2018 due to its OLED panel and unique design. The combination of a sophisticated display and a sleek form factor with portability in mind could be the next staple gadget for designers on the go. The USB-C interface virtually eliminates all factors that could tether this device to a desk, enhancing the overall value and practicality of such a beautiful gadget. The Asus PQ22UC could be the first ever OLED monitor to land on retailer shelves to finally provide PC users with its extreme capabilities in dynamic range and vibrancy. However, Asus did not provide any specific release dates or pricing for the PQ22UC. But since the panel maker JOLED (Panasonic and Sony) said that its manufacturing is on track, we could see this amazing device well within the year.